Paperback, 6 x 9 in. / 336 pgs / 230 bw. The story of cult figure Cookie Mueller's life through an oral history composed of more than 80 interviews with the people who knew her, including John Waters, Mink Stole, Gary Indiana, Sharon Niesp, Max Mueller, Linda Yablonsky, Richard Hell, Amos Poe and Raymond Foye -- with photographs by Philip-Lorca diCorcia, David Armstrong, Robert Mapplethorpe, Peter Hujar and others. By Chloé Griffin. 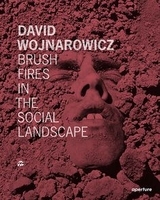 Contributions by John Waters, Mink Stole, Gary Indiana, et al. 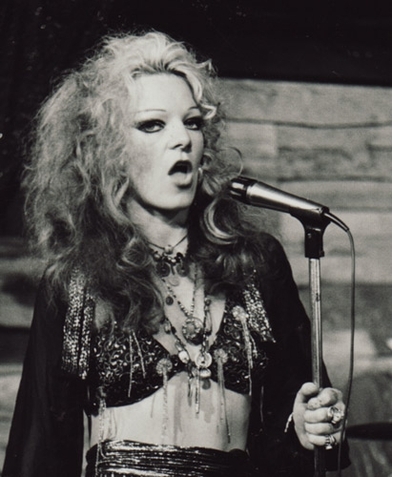 Cookie Mueller (1949-1989) was a firecracker, a cult figure, a wild child, a writer, a go-go dancer, a mother and a queer icon. A child of suburban 1950s Maryland, she made her name first as an actress in the films of John Waters, and then as an art critic and columnist, a writer of hilarious stories and a maven of New York's downtown art world. Edgewise, by Berlin-based actress and writer Chloé Griffin, tells the story of Cookie's life through an oral history composed of more than 80 interviews with the people who knew her, including John Waters, Mink Stole, Gary Indiana, Sharon Niesp, Max Mueller, Linda Yablonsky, Richard Hell, Amos Poe and Raymond Foye. 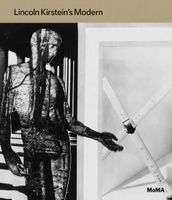 The contributors take us from the late-1960s artist communes of Baltimore to 1970s Provincetown and New York, through 1980s Berlin and Positano. 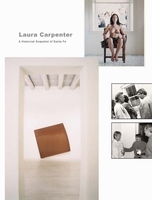 Along with the text, Edgewise includes artwork, unpublished photographs and archival material and photography by Philip-Lorca diCorcia, David Armstrong, Robert Mapplethorpe, Peter Hujar and others. Featured photograph, by Audrey Stanzler, is reproduced from Edgewise: A Picture of Cookie Mueller. Instead of an ordinary biography, Berlin-based artist Chloé Griffin's Edgewise: A Picture of Cookie Mueller is an oral history of the people who knew underground writer and actress Cookie Mueller, best known as a character in John Waters's movies Pink Flamingos and Multiple Maniacs: her friends, members of her family, and her colleagues, who shared their stories of the time they spent with the artist. For several years, Griffin traveled around recording conversations and taking photos that she distilled into a book spanning all periods of Cookie's life. In the pages of EDGEWISE, a labour of love of some eighty years, Griffin collected the memories of the people who knew Cookie best, compiling a sensitive and thrilling oral history that captures her life from her childhood in suburban Maryland, through the wild times with John Walters, Divine, Sue Lowe, Mink Stole, the others in Baltimore, to the times in Provincetown, where she lived with her son, Maz, and her lover of many years, Sharon Niesp. Mueller’s tale was too rich to capture in a traditional, linear biography, and knowing that wouldn’t do a free spirit like her justice, author Chloé Griffin took a different approach in her new book, Edgewise: A Picture of Cookie Mueller. Griffin labored for years, traveling and conducting extensive interviews with Mueller’s friends, family and former colleagues for their intimate accounts. 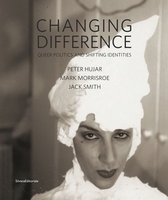 The book includes interviews with John Waters, Mink Stole, and Mueller’s only child, Max. Through oral history and photographs, Griffin weaves together a more complete look at the elusive legend’s life, and it’s as heartfelt and sincere as it is badass. To the people who knew her personally, whose voices tell her story in artist Chloe Griffin kaleidoscopio new oral-history tome, Edgewise: A Picture of Cookie Mueller (B_Books), she played even more myriad and fascinating roles. For the first time, through Griffin's book, we see Cookie as her friends and lovers saw her: as inspiration, protector, dancer, instigator, drug dealer, wild card, criminal, life of the party, goddess, mental patient, hostess, confidante, artist, mother, savior. Griffin tells Cookie's story by deftly weaving together interviews and insterspersing them with excerpts from Cookie's books and diaries so that her own voice gets into the mix. Though the chorus of remembrances can contradict each other or become repetitive, that's part of the point; there's no one truth to Cookie's life. 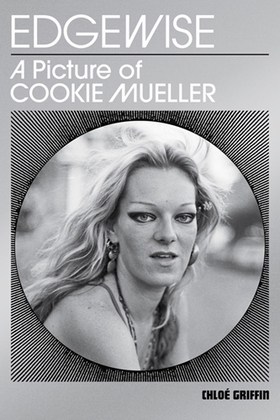 Mueller died of AIDS-related causes on November 10, 1989, and Chloé Griffin has written a book titled Edgewise: A Picture of Cookie Mueller, which pays homage to her life and is told through the voices of her friends, lovers, and family. One of the best reads of 2014. But the book is a kind of masterpiece. Chloé nailed it; her commitment and devoted effort, not to mention her style, in creating this book, do Cookie justice, which is saying a lot. 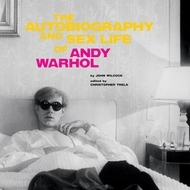 Cookie was unique and so, similarly, is this great book. 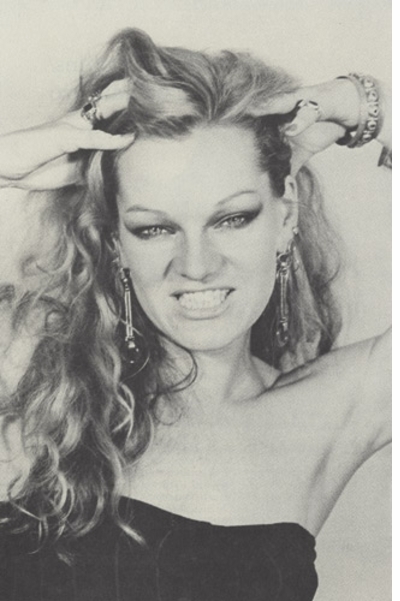 Featured images and excerpt below are reproduced from Chloé Griffin's love letter to underground Baltimore/Provincetown/New York figure Cookie Mueller, "quite possibly the best history of New York's much reprised 'last avant-garde' of the 1980s" according to Chris Kraus. "Edgewise reinvents the inspired amateurism of Mueller's work, and also creates unforgettable portraits of John Waters' Baltimore and Provincetown in the 1970s, 'when the water was still clean." 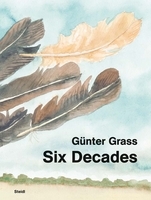 Text by Lorenzo Fusi, Marco Pierini, Bill Arning, Fiona Johnstone. By John Wilcock. Edited by Christopher Trela. Photographs by Shunk-Kender. FORMAT: Pbk, 6 x 9 in. / 336 pgs / 230 b&w.